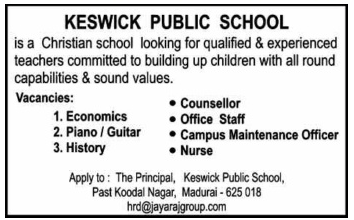 Keswick Public School, Madurai has advertised in Dinamalar newspaper for the recruitment of Teachers job vacancies. Interested and eligible job aspirants are requested to apply by earliest. Check out further more details below. About School: Keswick Public School is a leading English medium Christian school in Madurai, Tamil Nadu. Established by the BAME Trust, Keswick is affiliated to The Council for the Indian School Certificate Examinations. The aim of the school is to impart a sound, all round education with special emphasis on character building and strong ethics to prepare the child for life.